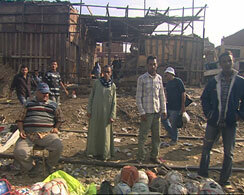 In one long shot the camera travels along the section of Cairo’s Friday market that is set up on railroad tracks. Here, framed by the highway and the Al-Imam As Safi’i cemetery, every Friday locals and vendors from all over the city offer their products for sale, set up on tables or spread on the ground. The camera moves at a steady, slow paste along the tracks, like a train passing a closed down station. The people inhabiting the market – the sellers and buyers, and the people living at its edge become the protagonist of the film, collapsing the borders between performance, documentary and fiction film. The slow paste of the shot allows the viewer’s attention to oscillate between the market in the foreground – the goods for sale, the dynamics between sellers and buyers, and the many (informal) architectural layers of the housing area and cemetery directly behind. I am equally interested in the complex and multilayered architectural constructions as in the informal economy of the market. The range of products for sale questions our western concepts of what holds value, and the very notion and definition of a ‘product’ in itself: What we easily label as trash - useless or broken parts - are being recycled and offered for sale, a sign not only of desperation and economic need, but also of faith in the creativity of the buyer to find a possible new use for these items. 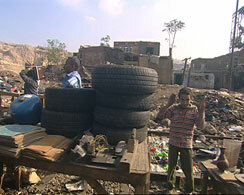 An Egyptian producer and crew were hired for the shoot. Due to the complications the presence of a foreigner would have caused in this location (including getting the shooting permits) it was agreed that the artist would not be present during the shoot. Consequently the crew and DOP followed simple instructions about the camera movement in the main shot as well as the making-of. The making-of documents the film shoot during the course of the day (from 6 am to the early afternoon when rain and a sandstorm hit the market) and offers glimpses into the socioeconomic context of the market, the location and its inhabitants through close ups of sellers, buyers and products, and short interviews with locals. Produced for Photocairo4 / The Long Shortcut / CIC with funding from Bm:ukk and Austrian Cultural Forum Cairo. 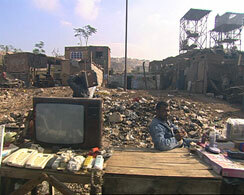 Friday market (long shot) and Friday market (the making of), both from 2009, work as videos that complement each other, triggering reflections on notions of location and the documentary framing of a place or situation. As often in Holzfeind’s work, this project deliberately confronts reality and the intentions prevailing in it with the act of intervention that capturing images inevitably involves, making the confrontation more eloquent and complex in the case of moving images and a world foreign to the artist’s original cultural context. Holzfeind was so aware of this critical condition of the observer that she decided to withdraw from the registration process; this distance, however, does not prevent one of the most remarkable effects of the project: the observer reveals herself as an agent that alters the phenomenon she views and becomes part of the process in the very act of looking. In Friday market (the making of), one of the interviewees remarks that the Friday market originated in the past, recurring with the regularity of the seasons. Despite this apparent timelessness, the Egyptian market possesses a particular spatial and temporal reality in unfolding its activities mainly along and on a railroad track in regular use. The market is a fixed point that again and again reunites a series of displaced beings and things; this mobile and overlapping nature of the market is overlapped by another explicitly mobile situation: that of the recording equipment. In the work Friday market (long shot), the camera movement is very similar to the point of view of any curious passerby. Notwithstanding people nowadays have learned to live with fixed and mobile cameras monitoring them, the presence of a steadycam (invisible to those who watch the video), guarded by a camera crew, emphasizes the invasive character of the registration process. While the moving image depicts a sequence of products presented for sale in accordance with the scene – which combine to a sort of neutral social catalogue – the observer of the video detects a tension, which is not necessarily aggressive. It is a tension between the obvious visual linearity of the recording and the alternating feelings of closeness and distance in the looks and attitudes of the others, the people the video “portrays.” These feelings are not caused by an increase in the visual intensity of the video, but by an additive process, a construction on the viewer’s part. The process suggests that the perception of space is not just a matter of the arrangement of objects, but also of the interaction of subjects. Heidrun Holzfeind’s work clearly reveals the ambivalence of the term shooting in relation to the capturing of images.